Happily stuffed with shave ice and saimin, my next big decision was how to use my lovely bonus free afternoon. I'd been thinking maybe a spin through the Honolulu Zoo or Aquarium, both of which have major nostalgia factors as places I loved to go as a kid, and both of which are within a very short walk of Lulu's place, but I had made it to both of those on my last trip and I wasn't particularly set on either one. Tane and her husband gave me a better idea when they mentioned that they'd hiked Diamond Head the day before. Perfect! The place I was staying is practically on the flanks of the crater, it is a steep but short hike with this massive payoff of a view, and it's better done early in the morning or a little bit later on in the afternoon to avoid the heat, which meant that I had plenty of time to go back to Lulu's for a nice bit of a nap, which felt downright luxurious in her lovely corner room with the fan humming and the jalousies all open to catch every breeze. Ahh. I think I woke up around 3 and was driving into the Diamond Head parking lot by 3:30 or so, perfect timing for non-rushed walk to the summit with lots of stops to admire the view. You can see the layout in this photo from the plane. The parking lot is down by the building, and the trail starts out as a gentle upgrade and then steepens into switchbacks and stairs as you climb toward the summit. Le'ahi is believed to have been formed about 300,000 years ago during a single, brief eruption. The broad crater covers 350 acres with its width being greater than its height. The southwestern rim is highest because winds were blowing ash in this direction during the eruption. 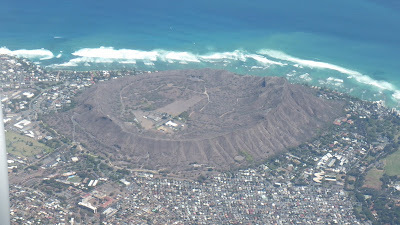 Since the eruption, the slopes of the crater have been eroded and weathered by rain, wind, and the pounding of the sea. 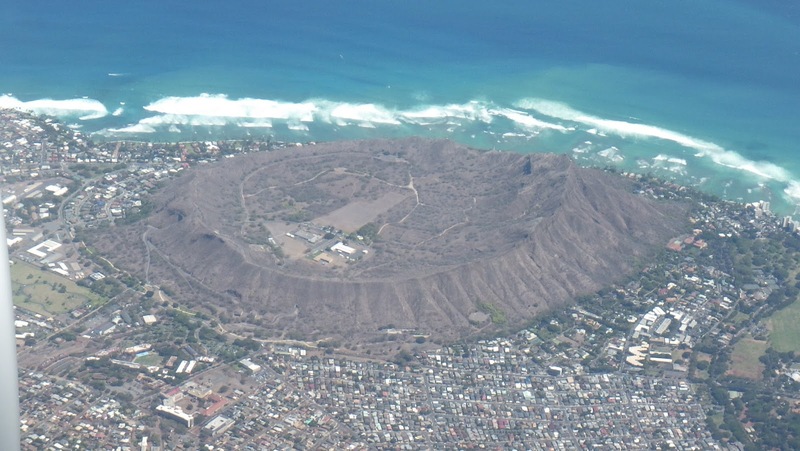 A coral reef now protects the seaward slopes of the crater. Here's the beginning of the trail. That's the only garbage can along the entire trail. I got to talking to a young lady who was picking up other people's trash up at the summit, and she told me that at one time there had been more, but the parks folks found that that actually made the littering problem worse so they cut it down to this one. Series of switchbacks. Pamphlet says, "The dirt trail with numerous switchbacks was designed for mule and foot traffic. The mules hauled materials on this trail for the construction of Fire Control Station Diamond Head located at the summit. Other materials were hoisted from the crater floor by a winch and cable to a midway point along the trail." I mention the winch 'cause I'll show that shortly. Trail was built in 1908 - whoever carved this did it a couple of years later. Looking back towards the crater floor and Ko'olau range again from further up the trail. And now we start into those pay-off killer views I was talking about. Looking east across the crater toward the eastern end of the island. Hanauma Bay is around the far side of the point in the distance. More stairs. I chose to take the longer switchback option - didn't really read the pamphlet until later and apparently the thing to do is take the steep way up and the switchback down and that way everybody's going the same direction, but fortunately there were few enough hikers on a Monday at this hour that my rebelliousness/laziness didn't put anybody out. Approaching the fire station, which was literally carved out of the summit. Back to the pamphet: "Fire Control Station Diamond Head was built at the summit between 1908 - 1910 and housed instrments and plotting rooms to direct artillery fire from several batteries. This fortification was an engineering marvel of its time." Up at the summit now - looking down at the Diamond Head light (good view of the reef here too). Back on the crater floor with some twisty old kiawe trees. The wood is wonderful for grilling, imparting a delicious flavor; kiawe wood gives the famous huli huli chicken that's sold for school and church fundraisers all over the islands much of its unique, can't-find-it-anywhere-else taste. Bees also love the kiawe flowers and the honey they make from them is luscious. I used to train Mistie, the sweet Sheltie I had as a kid, with the Leeward Training Club of Hawaii. One of the best instructors there was a beekeeper, and jars of kiawe honey from his hives were some of the most prized awards you could win at the obedience trials. I was absolutely delighted to find some at the Manoa Honey stand at the Kapiolani Community College Farmers Market - I added a bottle to the care package I sent myself at the end of the trip. I just took a quick break to go out to the kitchen to have a little and it's just as good as I remember. Back down at the parking lot now, where the plumerias were positively glowing in the late afternoon sun -- and oh so fragrant, I wish I could share that too! I was back to the neighborhood where I was staying a bit before six, and ready to eat again. I'd noticed earlier in the day that the Rainbow Drive-In, now very famous because that's where Obama likes to go for HIS plate lunches when he's back in da 'aina, was just a couple of blocks away. A good plate lunch is another one of my must-haves when I'm out there, so I decided to go check this out. Was fully expecting it to be another victim of its own popularity, with no parking and long lines for food, but I was pleasantly surprised on that front, there was a parking place right in the lot and the only delay was because everything on the menu looked onolicious, was hard to pick! In the end I got their house special marinated beef plate lunch (was good, although Lulu said she likes the marinated pork even better, have to try that next time I guess), parked the car near Lulu's and then walked on over to Kapiolani Park to find a picnic table. Classic plate lunch for dinner! OK, the two scoop rice kinda got descoopified while I was walking over here but the last time I showed a plate lunch on this blog it had VEGETABLES on it, which is pretty much sacrilege. This is how it SHOULD be done. Dinner done and the light getting very pretty, I decided to stroll over to the old Natatorium. This was a salt-water pool that was built as a war memorial. It opened on August 24th, 1927 and the very first swimmer (sez Wikipedia) was Duke Kahanomoku - and if you were on Google at all a couple of days ago you might realize that August 24th was actually his birthday, and I wish I'd looked up that entry in time to put these pictures up in honor of that! Oh, well, hau'oli la hanau a little bit late! After Duke made the inaugural plunge, there was a grand swim meet with Johnny Weissmuller and Buster Crabbe taking home the top honors. Must have been quite the occasion. Now it's just sitting there waiting for people to figure out what to do with it. The pool itself has been closed for years and the rumor among my friends when I was a kid was that it was full of needlefish and if you went swimming there they would poke you. Probably not but that's what they said. Maybe somebody's mom said that to make their kid stop pestering them because they wanted to swim in there. There are still people on a "Waikiki and Honolulu in the 50's and 60's" Facebook group I'm part of who remember learning to swim there - I'm probably the quietest person on that group 'cause of course I don't remember anything from the 60's (no no no, not like the joke about how if you remember the 60's you weren't really there, I don't remember the 60's 'cause I was 3 when they ended!) but I love reading the stories the older folks tell about the days before my time. End of another perfect day - moon over palm trees, a more traditional view of Le'ahi, and another amazing sunset. Back to my trip to Hawaii! Actually I'd sort of hoped I'd have to do a fishing trip report first from my first-ever fishing boat trip in NYC, but seeing as the only fish that were hungry were the non-tasty sea robins, which we threw back, I'll hold that for later. It was still a fun day on the water with a couple of friends from Sebago, and Old Time Vincent's Clam Bar and Italian Restaurant cooked up some excellent consolatory clams and a nice pitcher of sangria for us. Hey, if it's just about obtaining fish, you should just go to the fish market, right? Actually I did that on Sunday, got a couple of flounder filets and fried 'em up in butter and olive oil for dinner, had that with corn from the Cortelyou Road farmer's market for a nice easy summer dinner. We'll give the fishing another shot - the very nice lady who won the pool for the biggest fish with a lovely good-sized fluke said we'd missed the peak of what had been a very good fluke season in Jamaica Bay; she recommended October for blackfish, which might work out well with work and other stuff I've got going on, August is supposed to be a relatively quiet month at work but it hasn't been, and then September is always crazy. An October fishing trip might be a nice reward for getting through the crazy. Anyways - my second full day in Hawaii (really Day 3), I got in 3 of my "must-do's" for any trip back home. I went snorkeling, I had shave ice, and I had saimin (it's funny how many of my must-do's are must-eat's, but that's really kind of a Hawaii trait, I'm on a couple of Hawaii-themed Facebook groups and we spend an inordinate amount of time making each other hungry talking about poke and saimin and malasadas and spam musubi and all kine, local kine, ono kine grindz, 'cause there just isn't anything like the good island food we all grew up with and crave to this day). Speaking of Facebook groups, I met two Facebook friends out there. I'd already written about the excellent meal Keaka and I had at Aiea Chop Suey - so much better eating there with at least one friend, I am not somebody who has any problems with eating in a restaurant by myself, but at Aiea Chop Suey, it's much better to be in a group 'cause otherwise you have to pick ONE THING from the menu and THAT'S JUST SAD. Tane actually lives on the Mainland now but she happened to be back on Oahu around the same time helping out her father, so she and Keaka and I planned a Monday morning trip to Hanauma Bay. Unfortunately Keaka ended up not being able to make it (she and I went later in the week, I love snorkeling and willingly traded in thoughts of paddling, which is lovely in Hawaii but which I can do here in NYC anytime, for an extra snorkeling session) but Tane and I went ahead and went. I'd read that the parking lot there fills up fast, so we were aiming for 6:45 am and did make it there a bit before 7; that worked great 'cause the parking lot attendant wasn't even on duty yet so no charge (plus plenty of space)! This beautiful spot was very nearly a literal victim of its own popularity in the late 80's to early 90's, when unrestricted and careless use led imbalance and destruction, so now numbers are limited and everybody who goes has to watch a short film that talks about proper snorkelling practices. You still see plenty people walking on the reef, I guess they're thinking the guidelines don't apply to them, or they just don't care, but I guess enough people listen 'cause it doesn't look quite as bad as it was said to at the worst - the inshore coral still doesn't look so good, but there's a nice variety of fish acting pretty natural, not just the roving gangs of mooching mullet that people have told me were ruling the roost back in the days when people would bring bags of frozen peas to feed the fish (unnatural selection for the greediest and pushiest fish, which I guess were the mullet). We watched the film, walked down, I rented snorkel gear and a locker for our valuables, and then we hit the water for a lovely couple of hours. The water was a little bit murky, but I had much better luck catching fish with my camera than I did with my hook in Jamaica Bay last weekend! As always - click on any photo for a better view. Tane ready for some snorkeling! First fish of the day - not very fancy but I was still happy to see them. I wasn't quite sure what kind this was - they're silver like mullet but wrong shape, but I found a nice little fish ID card on the University of Hawaii's SeaGrant site and looking at that I think these guys are Hawaiian flagtail (Hawaiian name, which that card gives, which is nice, is āholehole). Here's a yellowfin surgeonfish, puaho. There are a bunch of different kinds of surgeonfish here with strikingly different colors, but they all have a similar body shape and the main thing that tells you you're looking at a surgeonfish is that they've all got that same little surgeon's knife sticking right at the base of the tail. A nice pair of bluestripe butterflyfish. Butterflyfish are another variety with all sort of varieties, but again, they tend to have similar body shapes and lovely colors - lots of bright stripes and splashy patches of black. Here's a parrotfish, uhu, hanging out with a school of convict tang, manini. Manini means this kind of fish but you also use it to say "little" in Pidgin english - "Kinda manini, da waves, yeah?". Manini aren't the biggest fish on the reef but they always hang out in good-sized schools so they have the advantage of numbers. I have to laugh at myself now 'cause I was just making some pedantic blanket statement about always being able to tell a surgeonfish (tang being another name for surgeonfish) by the little blade on the tail, but on these guys it's pretty small and hard to see. Same sort of pumpkinseed shape, though. Here's another uhu with a Picasso or lei triggerfish. This is one of a couple of fish that go by the famous humuhumunukunukuāpuaʻa,, which means triggerfish with a snout like a pig. This is not actually the one that's the state fish, that's the slightly less flashy (but still very attractive) rectangular or reef triggerfish. Whether that fish should be the state fish has actually been discussed more than one might think; obviously the name is tons of fun to say and of course there's the famous song where the humuhumunukunukuāpuaʻa goes swimmin' by, but it was once pointed out to me that these guys are found in tropic waters all over the place and although you can't beat the name for uniqueness, it might have been nice to pick a fish that's more unique to Hawaii. I don't have a strong opinion about this but I thought it was an interesting point. I didn't actually know that this triggerfish is also called a humuhumu until I posted it on Facebook when I got back, I thought that was only the reef triggerfish, but friends from the islands enlightened me. Slightly better picture of the same guy. I got better pix of the reef triggerfish when I came back a couple of days later. This guy sent me back to reefguide.org (a very well-organized site that TQ found when we were identifying fish we'd seen in the Caribbean in January) 'cause I'd honestly never seen one like this before and he's not on either of my fish i.d. cards OR the online one from U.H. I have to say that it is VERY neat to spot an entirely new fish here in a place that I've actually spent a lot of time. I think the birders call it a "life bird", when you see a kind of bird for the first time in the wild -so thank you Hanauma for giving me a life fish! Which I think is a Flying Gurnard - and isn't that kind of a fun name in itself? Picture's right-side up, it's the fish that's upside-down, trying to get an especially tasty bit of coral. This is a Four-Spot Butterflyfish (two on each side), Hawaiian name Lauhau. Done for the day, hoofing it back up the crater wall, and had stop to get a picture of the beach naupaka. There's a mountain variety where the flower grows with only the top half. There are local legends that connect the flowers to unfortunate lovers, parted or killed - you can read a couple of summarized versions here. Back up on the rim of the crater. Aloha for today! And what's better after a couple of hours of good snorkeling than shave ice (with azuki beans and ice cream YAY)? We went back to Tane's father's home to pick up her husband, and they took me to their local favorite, Waiola Shave Ice. It was delicious, with a really unusual texture - they grind the ice much finer than most places so it's very soft and fluffy, more snowy than crunchy icy. Tane said it almost tastes creamy to her. Really delicious! Funny thing was I happened to be wearing my Aoki's hat, didn't even think of it until Tane posted this on Facebook! Aoki's is close to getting back into business, they'd been hoping for the end of July but didn't quite make it, but even if they had, I didn't make it to that particular corner of the island this time. Even if they had and I had, it would have been a bit of a dilemma because one of the reasons I used to pick Aoki's over Matsumoto's every time was because the lines at Matsumoto's are kind of ridiculous when Aoki's made a perfectly wonderful shave ice -- but of course if they'd started selling their shave ice again after a couple of years off the week I was there? My gosh, the line would've been halfway to Waimea. Anyways, Waiola was delicious, the company was good, and I stocked up on crack seed from their little store. We parted ways then and I headed back for Lulu's, very sleepy and ready for a nap before doing whatever I was going to do in the second half of the day. Another nice thing about going to Hanauma Bay so very early was that enough of the day was left that I was going to be able to fit in a solid second activity -- I'd been actually stressing out about the shortness of my stay vs. the things I wanted to do (or eat), so this was absolutely a gift. And speaking of eating - the route back to Lulu's took me down Kapahulu right around lunchtime. 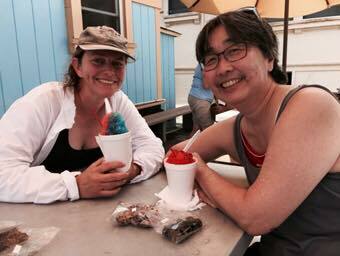 The shave ice had been a perfect post-snorkeling snack, but I still had room for Zippy's! I was after that only-in-Hawaii noodle soup, saimin, of course, which Zippy's does well. I do wish I'd taken a picture of the specials board for Baydog - where else in the world would you find a fast-food restaurant offering a tripe stew special? Next up - the afternoon's adventure! Tonight's dinner, late but good. Tomato and basil from the garden; didn't have time this week to get to the deli that still sell's Joe's Mozzarella but the fancy mozzarella di buffalo from Dean and DeLuca is a passable substitute. No idea what variety of tomato this is except that it's orange and meaty and delicious. I got the Dragonetti Heirloom Pack of Mystery this year, as I like to do when Dragonetti's has them. They don't actually call it the Heirloom Pack of Mystery, but it's 4 assorted seedlings labelled "Heirloom", no detail beyond that, and you never know what you're gonna get until the fruit ripens, which is actually kind of fun. Haven't had a bad one yet. Hawaii 2015 Day 2 part 1 - Back To Aiea! Zero Net Plastic Day - I FINALLY did it!